This is a guest blog by Simon Lewis, Head of Emergency Planning and Response at the British Red Cross. His team coordinates the charity's emergency planning and response work in the UK, which includes helping those impacted by flooding. If I asked what you were doing in January 2014, would you know the answer? For some people the memories of that month are a post-Christmas blur of dark nights, box sets and trying to be enthusiastic about the gym. But for others, it one of the worst months of their lives. Perhaps you remember the news footage. In parts of the UK, the year began with some of the worst weather seen for hundreds of years. Strong winds, tidal surges, rain and flooding left thousands of people without any power or water. 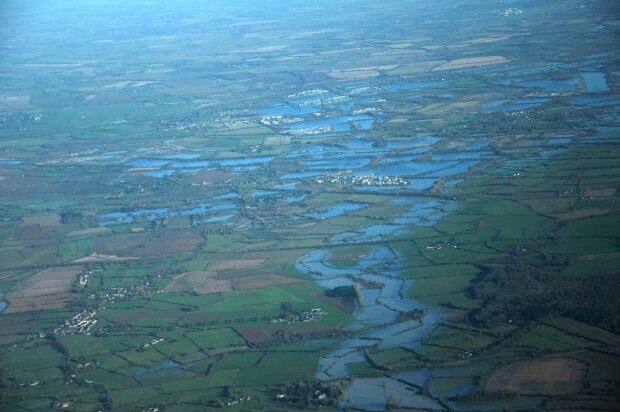 Some communities in Somerset were flooded for weeks. From Cornwall and the Channel Isles to Wales, Surrey and the Isle of Wight, our volunteers were out in force. They donned their wellies and high-vis jackets at all hours of the day and night to help more than 4,000 people in need. This winter, I’m hoping things will be different. Whilst I can’t promise there won’t be floods, I can say it’s now easier to prepare for whatever this winter throws at us. All you need is a smartphone. Here at the British Red Cross we’ve designed a new, free emergency app. Now you can get live alerts and advice to help your family tackle severe weather and other UK emergencies as they happen. You can get flood warnings for locations in England thanks to the Environment Agency, whose data and information are available to all. This is the first app to use this data and bring you real-time local flood alerts. The data for Scotland, Wales and Ireland is managed by each country, and we hope to offer UK-wide flooding alerts when all the data is available. The app also provides UK Threat Level updates and severe weather warnings from the Met Office. Not only can you stay up to date with the weather in your postcode – you can also keep an eye on the people and places you care about. So if there is a storm heading for your Mum’s house or your nephew’s school, you’ll be one of the first to know. As well as warnings, the app offers practical advice for what to do before, during and after emergencies such as flooding, fire and power outages. You can use the app to check your current location – which will be very useful if we see any more of the thick fog that obscured parts of the UK earlier this month. The app comes with a flash light and an alarm if you get lost – plus you can tell loved ones you're safe in just a few taps. Download the free app today from redcross.org.uk/emergencyapp – then encourage all your friends and family to get it too. Now is the time to get ready for winter – and all it takes to stay safe is a couple of clicks.